I have a story to tell, I do not have permission to tell it publicly, but here I proceed anyway. It is a story of love, pain, learning and unlearning. This weekend was Art On The Square here in Belleville where we live. It is a big deal for a small city to have such a highly acclaimed event with such talented artists. So with the children spending the evening with my parents, the woman I love and I went to go see the art. As with any event of this type, there was art I liked and art I disliked, there were high points and low points; which admittedly would have changed based on style and preference. After an evening of great art and good conversation with several of the artists we wandered into the booth of Ron Phillips. Phillips is an amazing artist who uses his media to both tell the story of his people and to inspire hope for a better story future generations will tell. As we were both gushing over our favorites of his pieces he pointed out a particular piece he wanted to show us. 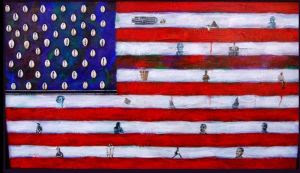 This picture was a timeline of the atrocities against and accomplishments of blacks in America set on a USAmerica flag. The piece had photos of the colonial slave ships and whites only signs. It had pictures of heroes like Fredrick Douglas, Harriet Tubman, Malcom X and Barack Obama. I commented that it was an amazing piece and captured the timeline well. The artist then pointed to a photograph within the picture and asked me if I knew who the person was. I did not, so I responded, "No, but I can identify most others." Phillips proceeded, "That's Emmett Till." I answered back, oblivious to what was taking place outside myself, "No, don't know him but I do see..." and I began to proceed to identify a few of the works subjects. As I rattled off my repository of useless trivia I was interrupted to be taught a lesson on listening to pain. This woman I love spoke over me to the artist, "Tell us his story." I silenced myself and listened as Ron shared the details of the tragic death of a little boy named Emmett Till. As Phillips finished his story my wife put her arms around him and just cried mourning the disgraceful brutal end of this boy's life. I watched as her and this artist, this stranger, shared the pain of the sickening curse poured out on this boy. When the two of them broke their embrace Ron told her, "That was the highest compliment on my work I received tonight." No one would have believed it not true. I am in debited to them both for what I learned in those moments.